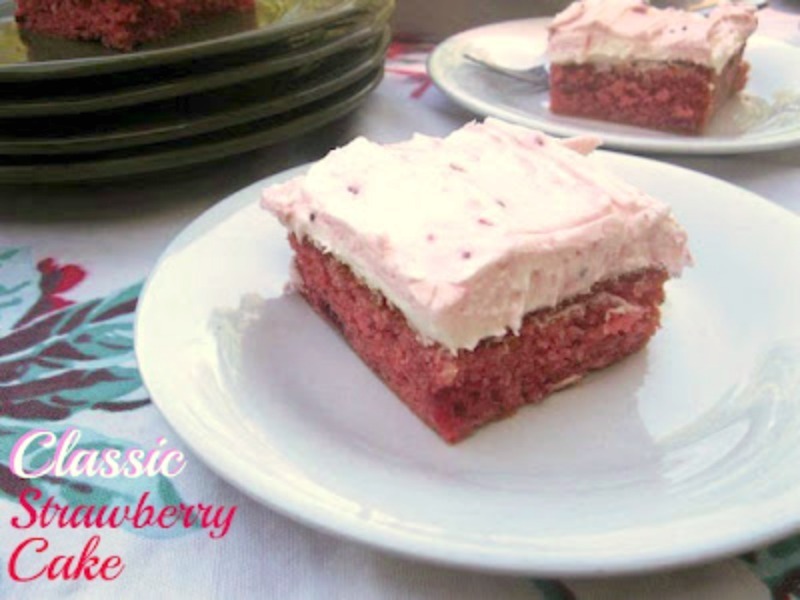 Strawberry Sheet Cake with Strawberry Cream Cheese Frosting is an easy, quick version of the Strawberry Cake from the sixties my Mother made. She used the classic ingredients, white cake mix, strawberry jello, and a carton of sweetened frozen strawberries. Mother's Day is Sunday, and I would like to give tribute to my Mother with this wonderfully delicious Classic Strawberry Cake recipe of her's. She has always been and will always be my inspiration for the passion I have for cooking. She loved visiting with ladies and talking about new recipes as much as I do today. You have to remember back in the '60s when I grew up, there was no internet, and the recipes were written down on anything you had in your hand at the time. Some of my Mother's recipe are written on napkins, backs of advertisements, but her favorite place to write them down on was in just an ordinary spiral notebook that is so tattered and discolored that we (my sisters) have to handle it with care these days. That is the cookbook that I use to cook her recipes from today. The one thing that I have noticed most about it is that she wrote down more baking recipes than her cooking recipes. What I mean by that is, that when you bake, you have to have the right ingredients and measurements to bake, or it will not turn out right. But with cooking, she was one of those that did a pinch here, and a tab there of seasoning and ingredients. You probably have someone you know that cooked like that too. They are who I call Classic Cooks! What I just love most about my Mother's recipes, is that they bring families together. 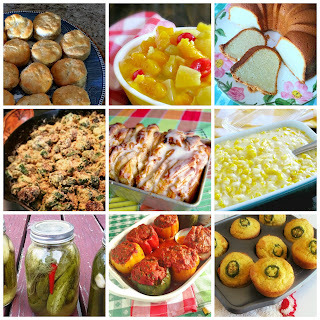 Whether, you are eating around a table with family, or in your kitchen cooking my Mother's recipes, Mother's Classic Family Style Recipes always makes you feel like you are family. This classic cake recipe has been around every since I was a little girl. Like other classics, this cake came around in the mid '60s when cake mixes were readily welcomed in many kitchens, and with the jello being added to many cakes, a recipe for this luscious cake evolved. Over the years, I have seen this cake in many magazines, cookbooks, and now over the internet, and there is so many variations. The original cake recipe is made with a carton of frozen strawberries and the frosting is a strawberry buttercream, but with fresh strawberries so readily available now, I now use fresh strawberries and for more richness (not that it is not rich enough), I added cream cheese to the frosting. It is absolutely delicious and would be a great cake to make for your Mother or Grandmother on Sunday. Have a wonderful Mother's Day Everyone! An easy, quick version of the Strawberry Cake from the sixties my Mother made. She used the classic ingredients, white cake mix, strawberry jello, and a carton of sweetened frozen strawberries. Butter and flour a sheet pan or three 8-inch round cake pans; set aside. In the bowl of an electric mixer using the paddle attachment macerate all the strawberries; RESERVE 1/4 CUP FOR THE FROSTING. Add jello, oil, and eggs beating until well blended. Add cake mix and water and beat until smooth and well incorporated. Pour batter in prepared pan(s) and bake for 30-35 minutes depending on how large your sheet pan is and if you use the round pans which could take 20-25 minutes. It took mine 30 minutes in the sheet pan. Remove from oven and cool completely before frosting. In a bowl of an electric mixer using the wire whisk, cream butter and cream cheese until fluffy about 3-4 minutes, stopping and scraping down bowl in between beating. Add powder sugar a cup at a time until all is incorporated. Add vanilla; beat until smooth. Add half and half a tablespoon at a time as needed. Notes:  Marbling Cake - Scoop out 2/3 of the cream cheese frosting and frost the cooled cake. With remaining frosting add the 1/4 cup reserved macerated strawberries and beat until smooth. 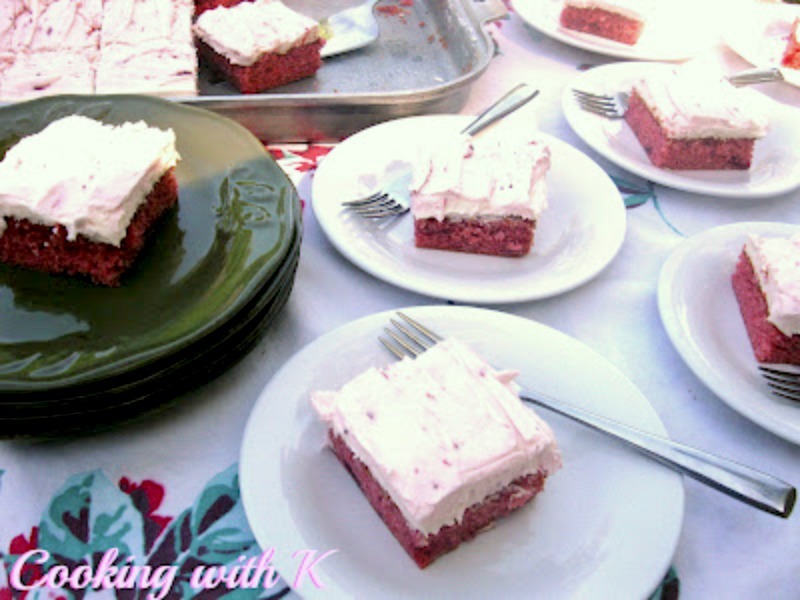 Using a large spoon or scoop, dollop strawberry frosting 3 inches apart in a row on top of the cream cheese frosting. (May have frosting leftover.) After dollops are on top of the cream cheese frosting, take a knife and pull the strawberry frosting through the cream cheese frosting giving it a marbling effect. 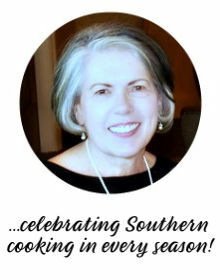 © Copyright 2009-2017 - Kay Little, Owner/Author of Cooking with K - All rights reserved. All images and content here on Cooking with K are protected under the Digital Millennium Copyright Act. AWWW Kay - what a fantastic way to honor your mama. This cake looks sooo tasty. Wish you lived next door...I'd sure be willing to help you clean that plate. I wish you lived next door too...I would let you :) Happy Mother's Day to you! 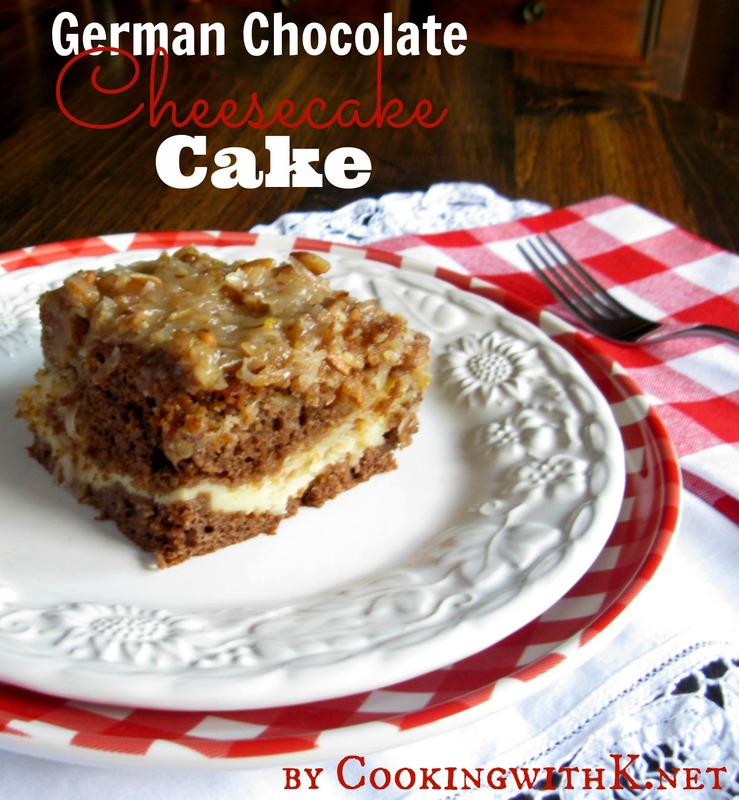 I have this recipe too, and it is so moist and delicious. I love your addition of the cream cheese frosting. Very pretty cake! Olá. Vi seu blog no Rosa Sábado. Amei ver o que escreveu sobre comer em família. Realmente nada melhor para a união da família. Esse bolo deve ser muito bom. As I was reviewing links on Beverly's Pink Saturday blog post - that strawberry wording/cake caught my eye. I thoroughly enjoyed your sentiments on baking vs. cooking and everything in between. I am somewhat like you there. But, what's funny is that the strawberry-ness of your post photo/wording caught my eye b/c mom made me a castle cake (pink and strawberry) many moons ago and I think it's neat is that we are both looking to and from our mothers ... that's neat. My castle cake recipe can be found on the page "Pinches of This and That" on my blog. Enjoyed my visit! Thanks and happy Pink strawberry Saturday! This recipe looks delicious! Thank you for sharing. I need to give this a try. 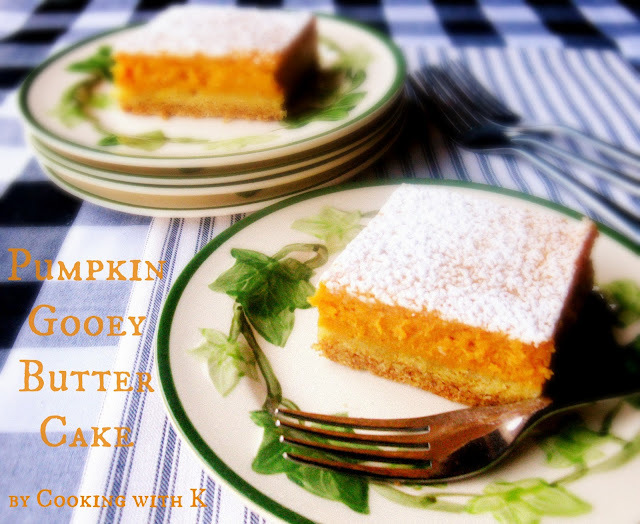 What a wonderful, classic recipe! My brother's favorite cake is strawberry cake. I'd enjoy making this for him some time. :) Thank you for the friendship on FoodBuzz. Hi , this very nice recipe for making cake. Thank you sharing this recipe with us. Strawberry Sheet Cake - What size pan & what is a sheet pan. I look forward to any responses. A sheet pan is like the one in the photo. They range in different sizes. It depends on how thick you want the cake. 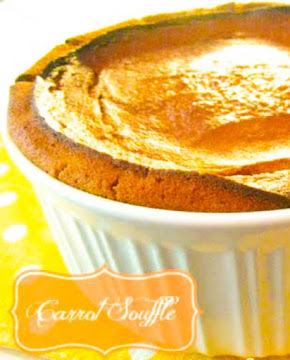 This was so wonderful...I followed the recipe to the tee and it turned out perfect. This didn't last long around the house. I will make this again for sure. Thank you for stopping by! So happy your family enjoyed it!